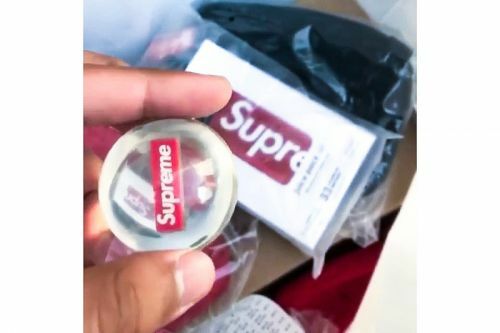 With today kicking off the rollout of Supreme 's Fall/Winter 2018 collection, the streetwear powerhouse is gifting its fans with a free bouncy ball. Similar to the free "Sky Bounce" handball novelty from the Supreme spring/summer 2016 collection , the clear accessory houses a tiny double-sided box logo in its core. As for the free stickers, the Madonna photo tee is included in a negative x-ray-esque style, while miniature bottle caps are included in a sheet of four. No box logo sticker is present, however a liquid Supreme font sticker takes it place.